PEARL HARBOR, -- Littoral combat ship USS Coronado (LCS 4) departed the waters surrounding Hawaii to continue its 16-month rotational deployment to 7th Fleet in support of the Indo-Asia-Pacific rebalance, Sept. 29. The ship's departure followed a brief maintenance period, pre-underway checks, and sea trials to validate repairs to two high-speed flexible couplings in the ship's propulsion plant. The high-speed flexible couplings failed while Coronado was en route to Singapore, Aug. 29. Following the casualty, Coronado returned to Hawaii under its own power and commenced repairs to the couplings. A group of maintenance specialists who evaluated the damage to Coronado determined this casualty was not a result of human error, but rather a material deficiency. Though not as severe as the casualty Coronado experienced, USS Independence (LCS 2) experienced a similar casualty to its high-speed flexible couplings earlier this year. 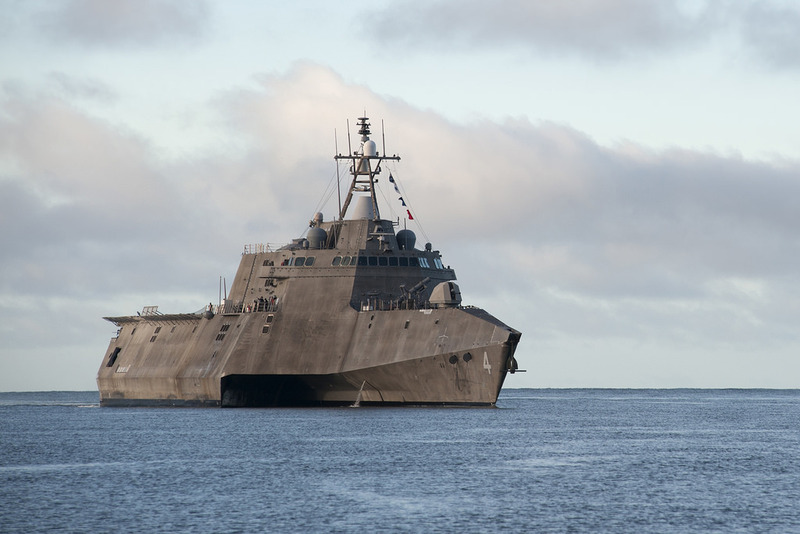 The Navy is working with shipbuilding company Austal to identify related design deficiencies. Coronado and its combined crew of about 100 Sailors assigned to LCS Squadron 1 and Helicopter Sea Combat Squadron (HSC) 23 began their deployment June 22 after departing their homeport of Naval Base San Diego. They participated in the Rim of the Pacific 2016 exercise, in which the ship successfully completed a Harpoon Block 1C missile LCS-based launch. The firing of the Harpoon missile from Coronado represented the first time over-the-horizon (OTH) missile technology has been introduced to the LCS class. Coronado's deployment is part of an initiative to deploy up to four littoral combat ships to the region on a rotational basis. Coronado will operate out of Singapore as a maintenance and logistics hub from which the ship will conduct patrols and train with regional navies during exercises like Cooperation Afloat Readiness and Training (CARAT). Coronado deployed with a surface warfare mission package that includes two 30mm guns, two 11-meter rigid-hull inflatable boats and two six-member maritime security boarding teams. HSC 23 is embarked aboard Coronado with one MH-60 helicopter and two MQ-8 Fire Scouts unmanned aerial vehicle equipped with maritime surveillance radar (Telephonics AN/ZPY-4). The ship is assigned to U.S. 3rd Fleet. U.S. 3rd Fleet and U.S. 7th Fleet complement one another across the spectrum of military operations in the Pacific. The US Navy Littoral combat ship USS Coronado (LCS 4) returns to Joint Base Pearl Harbor-Hickam during Rim of the Pacific 2016.